Read more about these remarkable women on our She Built NYC page. Artist’s Statement: While many were beginning to organize the fight for America to live up to its promise that ‘all men are created equal,’ Shirley Chisholm’s trailblazing life promoted us to consider the equality of all humanity. Chisholm Trail Memorial is a bold and timeless dedication to Shirley Chisholm, supported by her own powerful words. Her inspiring quotes are embedded into the ground on the sidewalk leading to the Ocean Avenue entrance of Prospect Park. This trail tempers visitors to the mindset of this great woman as they approach her monumental bronze representation framed by vertical jets of water and light. Sculptor Tanda Francis is inspired to create public work in the spirit throughout history of honoring great contributors to society through the creation of representational heads. Chisholm Trail is a colossal dedication which the people of New York City and the world will seek out and know our commitment to honoring the women who helped build New York. 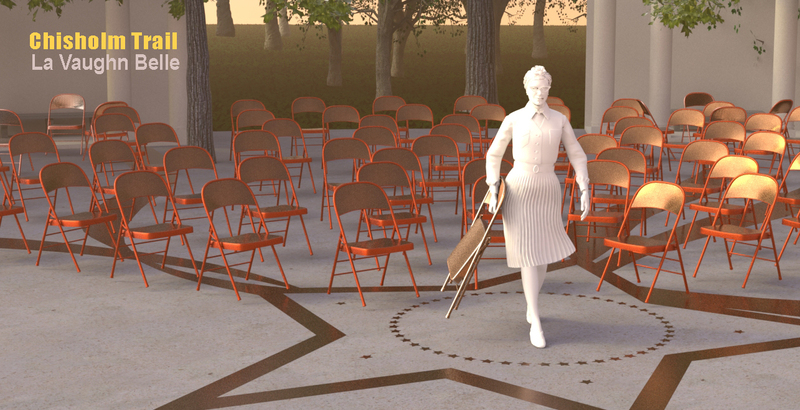 Artist’s Statement: This proposal reinterprets Shirley Chisholm’s famous quote, “If they don’t give you a seat at the table bring a folding chair,” and positions it into a larger framework of mobility. Prospect Park is known as Brooklyn’s Backyard. The sculpture that inspires me is one that reflects the breadth of Shirley Chisholm’s impact and also illustrates her as a woman who was deeply in touch with the people of the Brooklyn community. In the current political and cultural landscape, art is about accessibility and immersive experiences. Rather than portraying Shirley standing at a podium and speaking down to her audience, this model will instead show her rooted in the peoples’ space and speaking to their truths. Shirley’s figure will be created at human-scale and seated at the viewers’ level so that audiences can engage with her. The car on which she’ll sit not only captures a moment in time, but it also emphasizes the social relationships of the community— this will be a space for people to congregate. 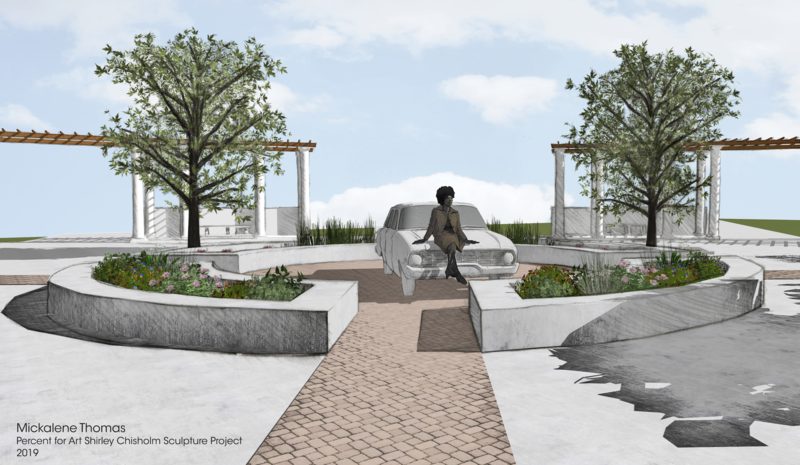 The surrounding environment will have dual-purpose benches/planters and in them the plant life will be selected to reference Shirley’s Caribbean heritage. 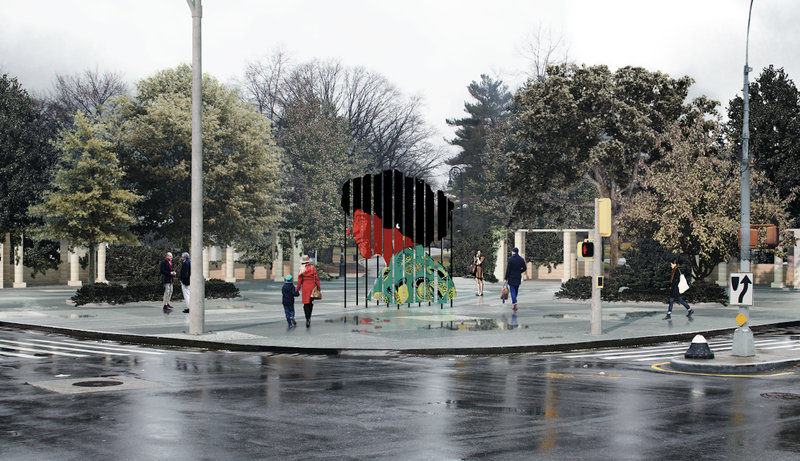 By employing a nontraditional sculpture to depict a nontraditional force, the monument is meant to highlight the fortitude of both Shirley Chisholm and the people she represents. This is ultimately about the visibility of everyone in the community. 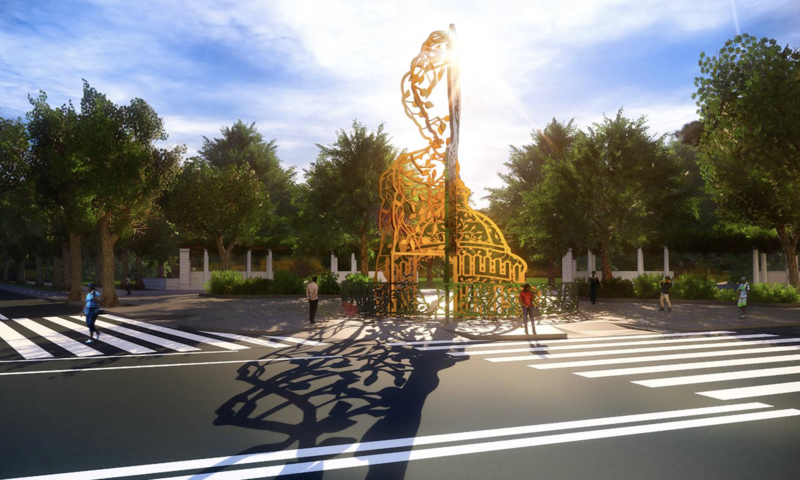 Artist’s Statement: The monument to Shirley Chisholm is comprised of a series of hand-painted metal columns that collectively shape-shift into three respective portraits of the trailblazing legislator and first African-American presidential candidate. When viewed from different angles, this traversable forest of flower-like posts will transform into three different representations of Shirley Chisholm. As the viewer walks around the sculpture, the partial images painted onto each of the posts’ three sides will coalesce into three distinct portraits. Each one represents a different aspect of Chisholm’s public role and accomplishments. The eastern-facing portrait memorializes Chisholm’s role as an activist. In this depiction, Báez reenvisions a source-image of Chisholm orating—in “activist mode”—with likeness to Oya, the fiery Orisha of destruction and construction. The western-facing blue-hued portrait memorializes Chisholm’s role as a an advocate for healthcare and access to nutrition for families as fundamental rights. Here, Chisholm’s portrait is related to the Orisha Yemanya, who harbors wisdom and offers care. The front-facing portrait, visible from the intersection of Park and Ocean Avenues, weaves together the red, black, and green hues of the UNIA flag. 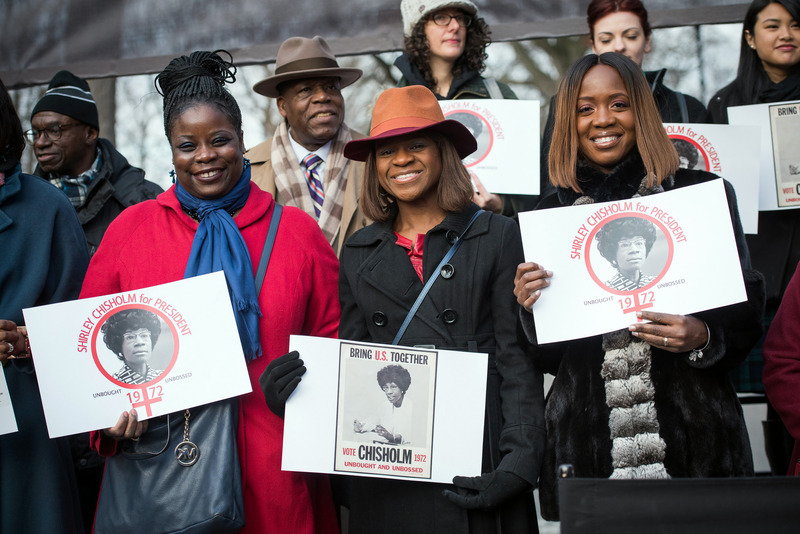 A descendent of Caribbean parents, Chisholm’s personal relationship to a united African diaspora was characteristic of the time period in which she fought for civil rights in her community. The portrait celebrates the contributions Chisholm made as a legislator. The proposed monument will be an accumulation of hand-painted, vertical steel columns, each measuring approximately 10-15 feet in height and anchored into a poured concrete foundation covered with pavers. A point of inspiration for this sculpture’s form is the monument to Nelson Mandela in Howick, South Africa. Artists’ Statement: We have created a monument to Shirley Chisholm that celebrates her legacy as a civil servant who “left the door open” to make a space for others to follow in her path toward equity and a place in our country’s political landscape. Depending upon your vantage point and approach to the Ocean Avenue entrance, you can see Ms. Chisholm’s silhouette inextricably intertwined with the iconic dome of the U.S. Capitol building. This mashup symbolizes how she disrupted the perception of who has the right to occupy such institutions and to be an embodiment for democracy. This trailblazing woman was not diminutive. 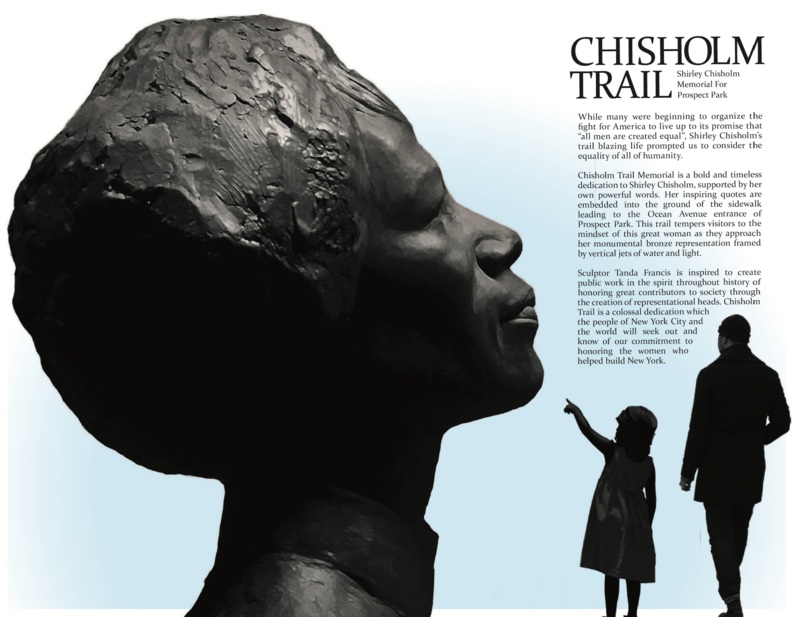 This monument represents how Chisholm’s collaborative ideals were larger than herself. The ground plane is carved in a shape that mimics the amphitheater-like style of congressional seating. Each seat pays homage to those who came after Ms. Chisholm as well as leaves room for those who have yet to come.